It’ll soon be five years since I was diagnosed. Five years of learning about this weird condition and my own particular version of it. Five years of working out what I can and can’t do; what I want and what is still left to strive for. And recently I have been thinking more about what I want – what I want to achieve, what I want to do work-wise, how I want to live, who I want around me. The result was satisfactory – limited to 50 hours a week, no more than five working days each week and a reiteration that I don’t have to work nights. The process was generally smooth, the occupational health doctor was lovely and I found the whole experience … deeply upsetting. Why? Because I had to sit in a room with a stranger and talk about all the ways in which this disease makes me feel not quite normal. To everyone else I downplay most of this stuff; brush it off with talk of “feeling a bit rough.” Here I had to talk in detail about the days when my legs wobble or the days where I have electric shocks shooting around my body. The days where getting out of bed feels akin to climbing a mountain, or the days where I should be using tena lady (but refuse because I am too damn proud) or the awful, awful moments where I can’t think of the word I need (this is increasingly the most distressing part of my condition – I forget words daily now and apologise here to the friends who have to put up with my blather. 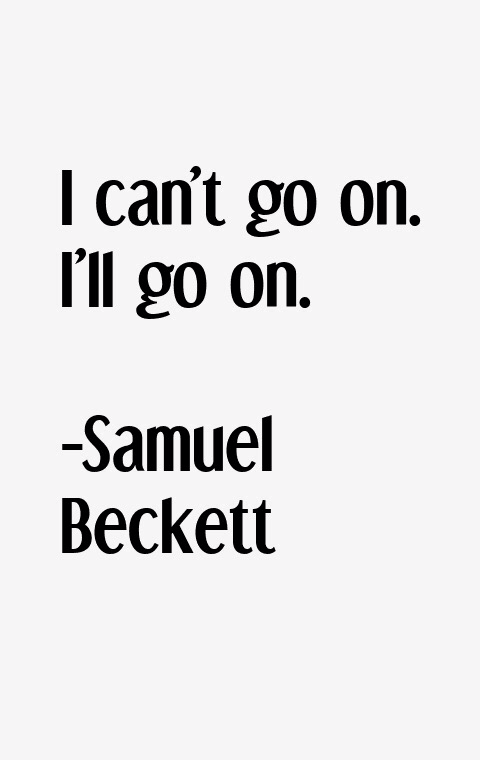 My husband has developed the habit of finishing my sentences for me – I am not enjoying hat much! )And I had to explain all of this whilst desperately hoping that she wouldn’t say I had to stop being a doctor. Because I think I am a good doctor. I am even a pretty good A&E doctor if I don’t have to move too fast! And she didn’t say that. Of course she didn’t. I am “mildly” disabled most of the time and patient care isn’t affected. But it shook me and I had been feeling a little low and anxious since. A friend and colleague recommended a website called moodgym (an Australian website which is CBT-based) and it has proved very useful. There are core erroneous beliefs that we all cling to despite them being unhealthy, and in times of anxiety they manifest themselves more strongly. So my new year’s resolution was to challenge those “wrong” thoughts, to try and eradicate unnecessary stressors and to “take it easy on myself.” When your body is unpredictable the rest of your life needs to be much more so. As dull as it is I need routine and regularity – routine hours, regular activity, stable relationships and a reduced to-do list. Stop working shifts. This is relatively easy to achieve as I have just finished my A&E work. But for future work planning I need to remember that what my body needs is to generally get up at the same time each day and go to bed at the same time. It needs food at regular and predictable intervals. Daytime sleeping makes the fatigue worse and my mood lower. I will still do the long bike ride in the summer that I have planned with my lovely friend, but we can take that steady, and eat Mars Bars on the way. Stop filling every moment. The cult of busy is strong in this house. The children are crazy busy and keep pestering to cram more in (although the boy child, recently turned 9 did burst into tears the other day because he “didn’t have enough time to play Fifa!” We had a chat about first world problems.) I like a nice full calendar – I like to see my friends, I like to sing in my choir, I like to eat in restaurants and have people for dinner. But I am approaching burnout. Me and Mr C haven’t spent an evening in together since Christmas. So I need to balance seeing the people I love who don’t live with me (and who are a great factor is keeping me steady – in “lifting me with love”) with the seeing of the one who does. So my theme of February is “Let it Go.” Let go of guilt, let go of toxic relationships, let go of frantic busy-ness and, hopefully, let go of this anxiety. No blog for a while – a sign of a healthy few months. In fact, I have felt so well that a few weeks ago you would have found me trying to convince my friends that an “X-treme 10k” through water and mud next February was a great idea for my next challenge and that they should definitely do that with me. I went to see the charming neurologist for my annual review and even asked him the question that had been buzzing at the edges of my consciousness for a while – “do I really have MS?” This question has been there since the beginning really, when a dismissive ENT Consultant told me and Mr C that the MRI changes she could see were probably “just from migraines” and I was suffering from nothing worse than “medical student hypochondria.” Dr Neurology dismissed this a few weeks later and gave me my diagnosis, and then after a year of too many symptoms, persuaded me that injections would make things much easier. And he was right – they did and relapses were further apart and milder. The change in regimen last year kept my symptoms dampened (although it made my migraines into killer migraines that make me think I am dying – “junior doctor hypochondria” anyone? – so I am back to daily injections and waiting for that particular hell to pass.) Before my review I was flicking through all the brilliant literature the MS society produces about symptom control and life with MS and realised that I was doing VERY well. What if we had got it wrong? What if I’d made all this fuss for nothing? Worried everyone for nothing? So I asked the question … And he looked at me with the patient look he uses when I act slightly barmy, showed me my MRI scans again, pointed out the white spaces and then let it sink in. I had been worried that I would look like an idiot if I had been misdiagnosed, but I had also been clinging on to hope that we were all wrong. Oh well. And until then I will bask in my blessings – the friends who leave me presents in the porch for when I finally get out of bed, the tween who will do my hair because my arms hurt too much to lift, the boy who will try and try to hug me better, Mr C who is trying so hard not to look scared, the NHS who keeps giving me medicine, and my duvet which is so warm and comfortable and is my raft on which I will weather this storm. As a keen (husband says obsessive) user of Facebook, I will often see posts about “invisible disabilities” which attempt to raise awareness of the difficulties people with a range of conditions face and ask for empathy and understanding. These are important messages and, inevitably, MS is always on the list.The nature of a relapsing-remitting condition is that much of the time a person looks totally well but may be struggling with a whole host of challenges that make day to day life tricky. In my case these can include fatigue, pins and needles and the trickly, slow decline in cognitive function that I am trying very hard not to obsess about (it’s entirely usual to forget your friends’ names isn’t it??) But I quite like the fact that I can keep these things invisible, only talking about them to those I want to and revealing things only to those I want to know. Sometimes the people I tell are almost strangers and I wonder afterwards about my own motivation, but the reveal is under my control. But not always. Sometimes you get worse and people can tell. This week I fell over. It was a proper comedy fall, with legs akimbo and underwear revealed. I hurt myself, although luckily nothing is broken. And I fell because I tripped over my shoe. It is a silly ballet pump type thing that is a bit loose and I tripped. But I also tripped because I couldn’t really feel where my foot was at that moment. The fancy name for this is proprioception and it can be an issue for those of us with MS. You literally don’t know where bits of your body are in space. It can make walking down the stairs a bit of an issue (especially if you are idiotically using your phone at the same time…) It requires the wearing of sensible shoes which seems to be new area of denial. The upshot of this week’s fall is a wrist splint and a bit of time wearing a sling. Because it happened at work, and because it wasn’t broken, the expectation was that I would stay at work. So I had to pootle around the wards with my sling on while everyone gasped and asked for an explanation. I tried to think up something comedic or dramatic but mainly just mumbled about what an old woman I was obviously becoming and smiled fixedly when a nurse told me “most times, when people fall, it means they are in the last year of life.” And I hated it – I hate the explanation that any physical evidence of illness necessitates. I hate the attention I get when I use my stick or slur my words. It is out of my control. It makes my invisible problem visible; takes the ownership from me and makes it public. So for the time being I am happy that things stay mostly hidden. I will do my bit to raise awareness and I won’t hide who I am and what I face, but here’s hoping it can stay on my terms for longer. Picture the scene a month ago: slightly harried “young” doctor with frizzy hair and a slight hint of wobble sits in a doctors’ waiting room thinking “please don’t let it be one of the disinterested rotational doctors, or even worse, one of my peers today!” I had come for my annual review wanting ANSWERS. Well, not really, I had come for my check up worried that someone was going to stop my medication. Surely I was doing too well to justify the NHS expense on these frivolous injections. I needed to see the top man in case I needed to plead my case. He touched my arm and told me I looked well. He was lying but did so charmingly. He introduced me to the medical student sitting in on the appointment who looked terrified. No doubt he was worried someone was going to ask him something tricky although, as previous posts have hinted at, MS is the medical school’s favourite neurological topic so he could have just recited “incontinence, disability, dementia” and all would have been well. He allowed me to gabble on about how well things were going, and how great the children are, and how lovely it had been to see him waving on the street when I was “running” the half marathon. And then he looked at me with a sad smile on his face. Here it comes I thought, I am ready to convince you without bursting into tears like the last time we had a conversation about medication and I failed to persuade you that narcolepsy medication would be IDEAL. He eventually talked me in to carrying on my hand-wringing with my specialist nurse (SHE was impressed by the marathon), and having blood tests and we have agreed that if my MRI shows any changes for the worse I will switch but if not I’m sticking with the injections. So tomorrow, in the middle of what is proving to be a really lovely festive season, I am off to lie in the scanner for 90 minutes. This is almost exactly four years to the day since I had the MRI which led to my diagnosis. That experience was awful because I had constant pins and needles which meant it was really painful to stay completely still. Hopefully tomorrow the only discomfort will be my tight waistband from Christmas over-indulgence and a sense that I really should be vaguely studying for the exam I have in four days time. And the lingering guilt about how much I actually cost to keep going. The new treatment would be quadruple the cost of the current one. And I have Dr Charming, and my own specialist nurse, and my GP at the end of the telephone .. .and the blue badge. I already cost the tax payers enough! So for all of your financial sakes, keep your fingers crossed that tomorrow’s scan shows a brain with no more extra blank bits because my wish for 2016 is for EVERYTHING TO CARRY ON BEING BRILLIANT. This weekend I forgot the word for seatbelt. I could pretend that this “word-finding difficulty” is rare but it is actually a daily occurrence. And today finds me once more taking to my bed, eating Dairy Milk and trying to keep my head still due to the return of my old foe vertigo. And it’s not even a fun day in bed. I tried clearing emails but fell asleep; I tried reading but my weedy arms couldn’t hold my lovely Atkinson hardback and I fell asleep; I tried speaking to Mr C about family organisational logistics but that made me dizzy so I pretended to fall to sleep. And forgot the word for Bible. But the thing is this is likely to be all my own fault. A few weeks ago I ran (euphemism) the half marathon. Despite a previous post on here declaring that I would never run I actually really enjoyed the day and didn’t make a show of myself. Given that I had loathed every minute of training I was surprised at how motivating it is to know that around each corner is someone cheering you on. But it was probably a daft thing to do. The loveliest of my lovely friends had tried to gently warn me that it might not be the greatest idea to push my body further than it had ever gone before (she has known me for 23 years and for most of those my fitness regime mainly involved smoking, then dancing like a loon, then more smoking.) Since the run I have worked the kind of hours you would expect a junior doctor to work (including nights and weekend), have had too many evenings out of the house, have wrestled with the the emotional exhaustion of negotiating with a headstrong pre-teen and juggled things whilst Mr C has been abroad. We topped this off with a mad dash around London last weekend to try and make full use of our Merlin passes (54,000 Nectar points well spent.) And now I’m in bed, Victorian consumptive like, fatigued by the effort of keeping on top of my CPD portfolio and other exhilarating online activities. It’s safe to say I have not found the right balance. Although the drugs are keeping me going, these shut- downs where I am compelled to lie flat and reboot are coming around every few months. It’s annoying for me, disconcerting for the children and not fair to my colleagues. 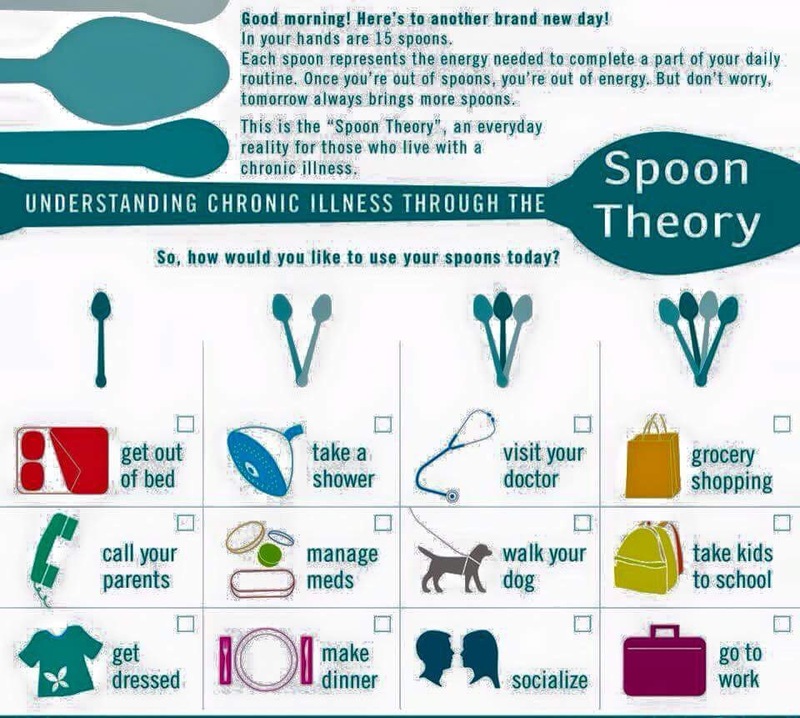 Those of us with chronic illness (ghastly phrase) are supposed to operate according to Spoon theory . We are supposed to recognise our limits and dish out our energy expenditure in spoonfuls or little parcels. The rest of the time we are supposed to rest to make sure there are enough spoonfuls left to allow us to meet our obligations. To prevent peaks and troughs we are supposed to be measured and careful. And of all the irritations of this disease (the inarticulacy, the need to be ever close to the loo, the clumsiness necessitating frequent new phone screens) this is the one I resent most. Like a child I stamp my feet against being told that I can’t do everything I want to do. Tears of frustration are shed about not being allowed live life to its absolute fullest. I DON’T WANT to stay in bed! I want to work and sing and dance and play and talk and cook and read and laugh without having to decide which parcel of joy needs to be set aside for my “own good,” which spoonful of life has to be rationed. Instead of forgetting the words I need to have a coherent conversation with my husband, I wish I could instead reject the words like “careful” “sensible” and “steady.” I suspect they may need to enter my vocabulary more frequently. I’m just not ready. I have never liked the long summer holidays. As a child in a somewhat unpredictable world I spent the summers longing for the return to school, the place where I felt safe and confident, where things were predictable and ordered. As a young teacher the summers stretched too far ahead and whilst my friends and boyfriend went to work I slumped on the sofa watching daytime TV; as a new mum everything that kept me going through maternity leave simply stopped for the summer and I was never very good at playing with my babies without an imposed structure! These days summer is marked by the rest of my little family going away for a fortnight without me, and me never being entirely sure where my friends are. It unsettles me because, as much as I can picture myself as a free spirit, ready to wake each day without a plan and see where the world takes me, in actual fact I am a control-freak entirely driven by the love of routine. 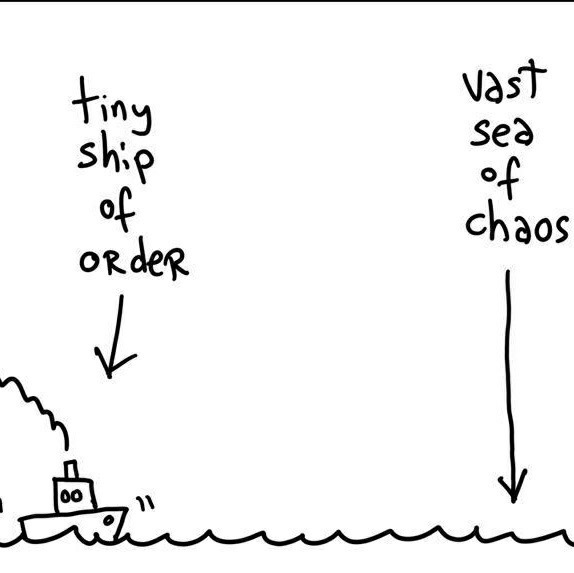 As a junior doctor all hope of a calm and ordered life seems to have melted away. Every four months we rotate to a different area. This involves meeting a brand new set of colleagues, negotiating the politics of a new department, learning brand new systems and trying to get to grips with exactly where you need to be when and what people expect of you when you get there. This has been even more challenging for the routine-driven me this time as not only have I changed specialities but I have also changed hospitals. Everything is different, everything is moderately confusing and the mummy filofax is bursting with lists of people I need to phone to answers questions about rotas, annual leave, computer passwords, vaccinations and mandatory training course. Everyone else seems to be sanguine about this; I flap around mildly manic about it all. It’s enough to unsettle me at any time but, with excellent timing, this move is happening during a relapse. A different kind of relapse – my limbs are all good but I can’t really see out of one eye and I am exhausted even before I get out of bed, never mind at the end of a twelve hour shift. I haven’t mentioned it to anyone at work because I’m determined (as ever) to push on through while I can. But I wish they knew, without me actually having to tell anyone. The move has had me reflecting once again about “disclosure” of my condition. We had to do one of those things where you introduce yourself to your new colleagues and say something interesting about yourself. For a split second I almost said “I have MS, its well-controlled and not currently a big deal. But sometimes I walk with a stick and I don’t want anyone to worry unduly about that.” I didn’t because I thought it might prove a bit of a downer, but I am left wishing I had a way of discussing MS in person the way I feel able to do here. Last night I read a blog post written by an American who exhorted his fellow “MS-ers” not to tell anyone about their condition unless directly asked. He warned of discrimination and stolen opportunities and advised that people keep their symptoms hidden if they can. He advised “don’t ask, don’t tell,” which irritated me. And while I work in the protected British public sector I am not naive enough to not realise that people do face job insecurity and prejudice in Britain when they tell of their diagnosis. So why do I want people to know?? I suppose part of it is practical. I want to be able to sit down briefly on a long ward round without people looking at me quizzically. I want to be able to rock up with my stick if necessary and for people just to accept that sometimes that’s how things are for me. I don’t want special treatment, I don’t want people to make allowances, I just want to be able to quietly adapt things without any fuss. I have not yet worked out a way of telling people without it seeming like there is a fuss to be made. End of term reportS has had a generally good year with some promising aspects in her development at work and home. There are still some ongoing areas for development which are preventing her from being entirely satisfied with her progress to date. Work: S has now gained full registration as a doctor. This will come as a surprise to her non-medic friends who thought she already had that. She has had a generally successful year, although we note that her enthusiasm levels have dipped occasionally. Surprisingly, she has shown no interest in doing any of the exams necessary to further her career. This is particularly surprising to her younger colleagues, many of whom are mightily ambitious and energetic! Nevertheless, her bosses seem happy with her progress, her admin skills remain top notch and the people she looks after seem to like her. She continues to worry that this is all smoke and mirrors and, at some point, someone will realise that she doesn’t know half the stuff she knew during her final exams only last year. Parenting: S is finding parenting a sweet-natured seven year old to be thoroughly rewarding and enjoyable. She is adept at hugs, providing cheesecake, praising piano skills and making up silly voices for reading books aloud. She is less good at feigning interest in Minecraft and always listening when he talks about Star Wars/Harry Potter/pokemon/moshi monsters/multiple other all-consuming obsessions. Must try harder. More challenging is parenting during the maelstrom of early-pubescent hormones that seem to have taken over her ten year old. Despite her best efforts S is currently not succeeding in pleasing said child and there is a great deal of stomping, shouting and sulking taking place on both sides. S needs to remember that she is the adult! Marriage: There has been a mutual decision to never again go on a camping trip together. Overall: happy state achieved despite daily stresses and occasional grumps. General life: S has not effectively got on top of her domestic to do list. Her living room curtains are still hemmed with safety pins and the decluttering project is still not in progress. Despite the plethora of cookbooks she owns she does seem to serve an awful lot of pasta and her front garden desperately needs weeding. S also continues to occasionally clumsily blunder her way through interactions with other people but is blessed with loyal, tolerant and life-affirming friends who luckily don’t mind if she is sometimes a numpty. She needs to develop more emotional resilience although her lovely friend J says that she also needs to remind people that she doesn’t wear a sticker saying “please tell me exactly what you think of me at all time” because actually she is a bit of a delicate flower. She has been attempting to list on Facebook things to be grateful for each day with varying success. One day she could only list being grateful for soup. Her friends would be more grateful if she posted less on Facebook. But she is bone-tired and hasn’t been feeling great recently. For three months now her pesky migraines have returned to plague her and scupper her attempts to be ever cheery. This has meant multiple trips to the kindly GPs who, at one point, offered her dementia screening because it was offered to everyone with MS L The new tablets seem to be working but it’s tentative progress. Even more irritating is that she can’t see properly out of one eye and that the fatigue is, at times, overwhelming. Having to sleep during the day affects her mood as she feels like she is unable to do any of the things she needs to to improve all the things listed above. Although the ten year old likes a mummy who lies on the sofa watching TLC because that’s all she wants to do as well – so maybe that’s a bonus.